What has 17 lenses, costs $17,000, and can make you feel like you're anywhere in the world? The YI Halo, a new virtual reality camera that runs on Google's Jump VR platform. Made by Chinese camera company YI with Google (GOOG), the Halo shoots 4k video simultaneously on all 17 cameras. It uses Google's Jump software to stitch the footage together into a single, immersive 360-degree VR film. Google announced the new hardware Monday, barely a week after Facebook (FB) revealed plans for a pair of its own VR cameras: the x24 and x6. "Cameras are hot. That's good. We planned this a while ago," Amit Singh, Google's VP of business for VR, said at a briefing with reporters in San Francisco ahead of the news release. The YI Halo will go on sale this summer, and Google says some early partners will get rigs right away. Why are consumer tech companies competing to make expensive hardware for a niche professional market? They really just want to sell more virtual reality headsets. But first, they need content people can actually watch on their futuristic face-mounted TVs. 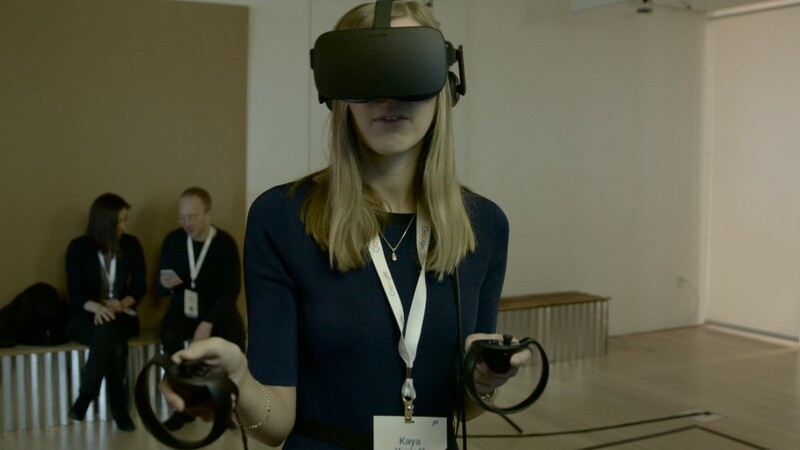 The tech industry has spent the past year pushing virtual reality goggles like Facebook's Oculus Rift, the Samsung Gear VR and the Sony PlayStation VR. Google has two of its own lower-cost products, the Cardboard and the Google Daydream View. But virtual reality experiences are in short supply, in part because of how much time and money it takes to produce quality VR movies. Like most VR camera rigs, the YI Halo is a bunch of action cameras cobbled together into a ring with a single camera on top. It looks like an old-school slide carousel and weight about eight pounds. Though it has dabbled in other hardware, including phones and routers, Google partnered with a camera company on the Halo instead of making its own. Google is instead focused on the underlying technology, like algorithms that can stitch footage together with minimal mistakes in hours instead of months. One early YI Halo tester is virtual reality filmmaker Armando Kirwin of Milk VR, who said at the press briefing that Facebook's cameras aren't really direct competition. Instead, the Halo is aimed at lengthy multi-million dollar productions that use expensive special effects artists to put together the footage. As YouTube-owner Google knows well, there can be an advantage to volume over quality when it comes to content. To get more people shooting, Google is launching a program called Jump Start. Filmmakers can apply for free cameras and use of the Jump software. Correction: An earlier version of this story misstated the price of Google's VR camera.